An injury-time equaliser from Jenna Carroll earned new Fylde Ladies manager Conrad Prendergast his first point at the helm in a hard-fought 2-2 draw away to Huddersfield Town Ladies in the Women’s Premier League. Chloe Adams’ spectacular strike gave the visitors the lead, but an effort from Terriers midfielder Kate Mallin sent the sides into the break on level terms. An error from debutant goalkeeper Alex Brooks gifted Huddersfield the advantage early in the second half, but Carroll’s last-gasp strike netted a share of the spoils. Prendergast made three changes from the side that was narrowly beaten by Blackburn Rovers in his first match in charge three days earlier, with Katie Anderton, Lisa Topping and Beth Stanfield coming in for Alice Forshaw, Kim Turner and Yasmine Swarbrick. The Coasters started brightly, but it took till the 20-minute mark for them to create the first real opportunity of the game. Laura Walker lobbed the ball over the defence for Adams to chase down, but her pattempt was just over. The effort proved to be a warning shot to the hosts and, just five minutes later, Adams got her goal. Left unmarked 25 yards from goal, she took aim and curled a wonderful strike past the helpless goalkeeper. The goal sparked some life into the home side and they really should have equalised on the half-hour. Former Coasters striker Emily Heckler did well down the left and fired a dangerous low cross into the box, but Carroll made an excellent interception in the nick of time. However, six minutes before the break, Huddersfield grabbed the leveller. Heckler once again found space in the box, and this time, she carefully squared the ball to Mallin who had the simple task of tapping home. The Terriers completed the turnaround after the break in bizarre fashion when Brooks smashed her clearance against Heckler and the ball comically rebounded into the gaping goal. The Coasters struggled to get going in the second half, but after a change in formation, they looked the most likely to score. Prendergast’s side had the ball in the back of the net in the final minute of normal time when Carroll headed past Charlotte Kenyon, but the linesman raised his flag for offside. 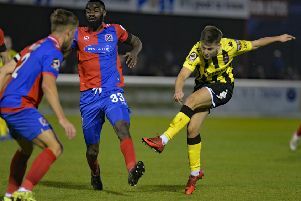 However Carroll wasn’t to be denied and just as it seemed as though it wasn’t going to be Fylde’s day, the midfielder popped up with an equaliser. Substitute Alice Forshaw found Carroll with her back to goal and she turned before drilling the ball into the bottom corner. Fylde: Brooks, Wilkes, Carroll, Farrell, Stanfield, Walker, Kennerley, Forster, Adams, Anderton, Topping. Subs: Forshaw, Swarbrick.